In 2005 Tappahannock Presbyterian hosted a seminar of speakers from various segments of the community- law enforcement, the courts, the schools, social services, and Bay Council on Aging to see where the talents and interests of it’s small congregation could be of service. The needs were staggering in this small county of less than 12,000 people with a median annual income of $24,000 a year and one of the most under-served counties in the state. Where would they start? What difference could this handful of caring Presbyterians make? With the encouragement of the congregation and TPC pastor Terry Robertson, Kathy Hughes and Alice Roye held several meetings with representatives from different races and denominations to discuss the overwhelming task. From this small group grew Essex Churches Together (ECT), an alliance of all Christian denominations in the county. The leadership remains with people from Tappahannock Presbyterian. For the first few years the primary service of the organization was communication- sharing needs, seeking volunteers, and learning about resources in the community by hearing speakers from groups and agencies each monthly meeting. Church representatives reported to each other about projects and programs that were going on within their walls and other churches were invited to join in. A couple of emergency food drives were sponsored. Different community projects were emphasized in different years. For example support was given to the establishment of a local Red Cross chapter and to the establishment of the Free Clinic. The Hanger, a program for teens was started and ECT made announcements about the need for adults and church support. The churches’ role in community disaster was a major theme for several years. ECT is a member of VOAD (Voluntary Organizations Active in Disasters). Information was shared with the county emergency services about facilities the churches could offer, and disaster preparedness and neighborhood disaster plans were disseminated to the congregations through ECT representatives. 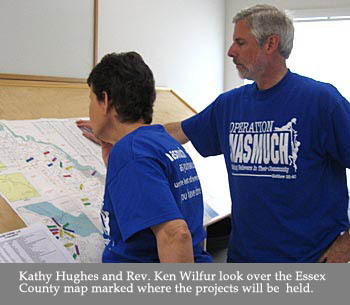 In 2008 Mrs. Hughes was attending a funeral at Sandston Baptist Church when she picked up the church newsletter and became interested in their outreach project called Operation Inasmuch. Intrigued with the project, she invited Troy Westerman to speak to ECT and share his experiences. ECT representatives were encouraged to visit the website: www.operationinasmuch.org. They contemplated for 6 months about sponsoring such an effort and it seemed right in line with their stated emphasis for the year- attending the needs of the elderly. The Rev. David Crocker, founding pastor of Operation Inasmuch in Fayetteville, North Carolina, came to Tappahannock to lead a workshop on how to implement the program. ECT members served vats of hot soup, sandwiches and homemade cake for the training night When more than 100 people came out on a cold bleak January night to a meeting about a topic new and different it was evident that something big was going to happen. The spirit and momentum was awesome, right from the beginning. The Soup Supper training event has become a tradition for the 2nd week of January to prepare for the actual mission day that occurs in April. Church Contacts, Team Leaders, and Pastors meet in their own sessions to learn how they will support this county-wide effort. The program gets its name from the Matthew 25 scripture “inasmuch as you have done it for the least one of these you have done it unto me.” Beginning in Fayetteville, North Carolina, an army town, the term “operation” was obvious. Operation Inasmuch (OIAM) has been going on in Baptist Churches throughout North Carolina now since the mid-90’s and has spread throughout the United States as well as Canada and England and Japan. Slowly other denominations have begun to take the idea and accomplish it in different ways, usually by one or two churches. Essex Churches Together’s sponsorship the first year of 18 churches of different denominations and races was a first, and Rev. Crocker returned to Tappahannock twice more, once for the opening ceremonies and again to glean information about how this small group was pulling off this huge event. 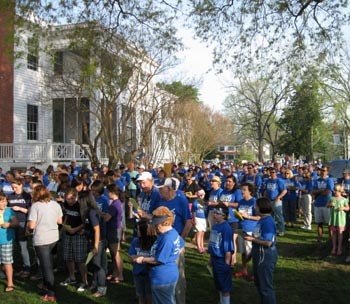 In 2011 There were 35 churches participating, over 800 volunteers, serving some 1200 people in a county of 11,270. Projects are in two main categories: restoration and repair ( R&R) and services and gifts (S&G). Homes are made safer and more comfortable. Service projects range from community projects such as cleaning up a school playground or hospital site to individual assistance to people with their laundry. The remarkable thing about the day, though, is not the number of projects or the number of volunteers involved. It is seeing people of all ages and races and Christian denominations working side by side as the hands and feet of Jesus in the community. Reticence and suspicion has been replaced by smiles and hugs. Teams bond and friendships form. People become aware of the conditions of some of their neighbors. On that day there are no Baptists or Presbyterians or Catholics or Methodists or Pentecostals or Adventists. There are only brothers and sisters living the love of Christ to people they had never met. Church members become sensitive to what had been left undone and are encouraged to continue this mission, particularly home repair, throughout the year. A closing ceremony the next day, Sunday is the time when the video of all the activities are viewed, stories of gratitude and hardship and caring are heard. Those assembled are given the charge to continue this lifestyle of mission within their own community.